I need a day to catch up on some things. You know what that means… Time for a Classic Caterpickle. 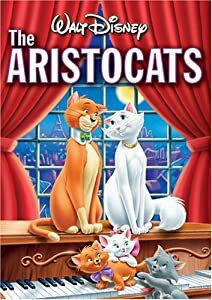 For a girl obsessed with cats, The Four-Year-Old is oddly indifferent to the Disney movie The Aristocats. I suspect this is my fault. The first (and only) time we watched the movie, my daughter suffered a severe disappointment. When she saw the Aristocats slurping happily at a bowl of cream, she naturally wanted to pour a bowl for our own cats. I had to shoot this down. Although Cozy, our normally timid grey tabby, would body slam Mulberry out of the way for a taste of the creamy stuff, the sad fact is our tabby’s tummy can’t take it. Despite the myth actively perpetuated by nearly every Disney movie featuring cats in any way, most adult cats, including our own, are lactose intolerant. They simply can’t digest the stuff. If you’re lucky, it’ll make them barf. If you’re not, well, let’s just say that cleaning the litter box the next day will be more of an adventure than usual. Distressing though it was for The Four-Year-Old to hear me explain that for our cats milk is poison, it’s actually a fairly normal development. Cats pretty much only need milk for about 8 weeks while they are kittens. After that, they get all the nutrition they need from their cat food and a fresh bowl (or fountain) of water. But when I offered to let her serve up some soy milk (which the iPhone tells me cats can digest) as a treat instead, she declined. Today’s the day! Let’s go vote!